This idea is about helping students to improve their project work. During projects students often work in groups to develop solutions and achieve goals. Most of the time the groups consist of members with different skills, interests, cultural and professional backgrounds. In a transdisciplinary approach, different forms of research and specific methods for problem-solving have to be combined and may result in several iterations to develop a solution or present a prototype. From our point of view it is important that students use a methodical procedure when working on projects. In the proposed approach the procedure is based on the idea of Design Thinking, which refers to strategic and practical processes where concepts for developing new products, services, etc. are developed by interdisciplinary teams. The results of the research, the outcomes of brainstorming sessions, the concepts of prototypes as well as the whole process have to be documented in an appropriate manner. This is important for the project itself but also for related future projects. Student projects in higher education should be viewed in a broader context and seen as part of a base research as well as the knowledge pool of a University. The documentation of the process can be done in several ways. Normally it consists of one or several reports with text and images, sometimes a video sequence and a prototype. Our approach is to build and implement a virtual three dimensional project environment, which is shared amongst all members of the project group as well as Professors. The 3D space consists of different areas where all the the information and tools can be accessed, stored and retrieved collaboratively. 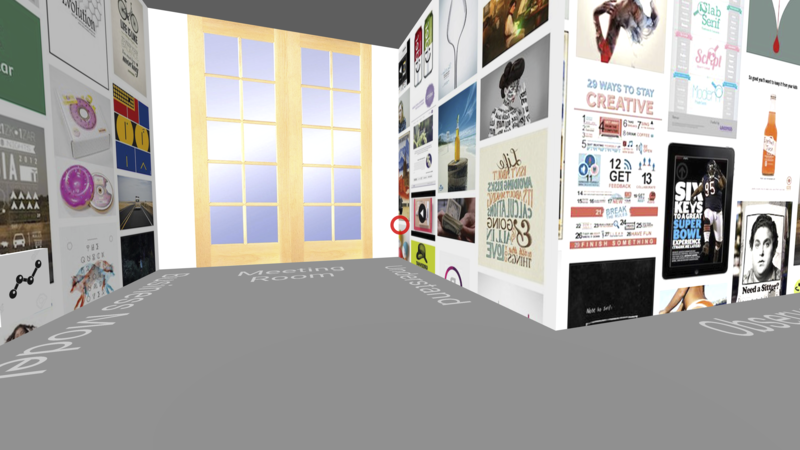 In addition, several virtual rooms are available, for example to meet and discuss issues, when not all group members are present on the campus. All members of the project group can add common or private rooms, which they can set up to their own needs. 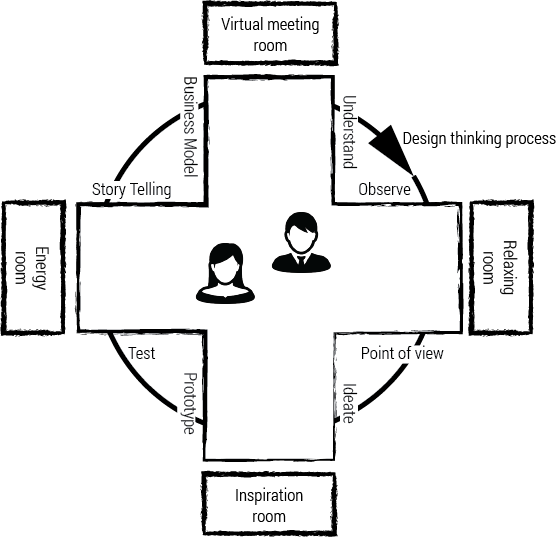 Figure 1: The methodical procedure during a project is mapped into a virtual three dimensional space, where all group members have access and work together collaboratively. The process follows the steps of the Design thinking method. The methodical procedure during a project is mapped into a virtual three-dimensional space, where all group members as well as stakeholders (for example teachers) have access. The procedure is based on the Design thinking method. Collaboratively the group members can access, store and retrieve information as well as tools in the different stages of the project process. The idea a storing information in the space is developed from the «method of loci» (Yates 1966) which uses visualizations and places or locations to quickly recall information. We propose that storing, retrieving, remembering and combining information is more effective in a three-dimensional space than on a two-dimensional surface. The space also reflects the complex nature of the various interconnected topics. It also allows to show and integrate parts of other finished, running or proposed projects to broaden the view and discuss the project in a global context. Project results can easily be integrated into future projects. The project environment also allows to integrate experts (or mentors) from the outside and communicate with them. The project «Three-Dimensional space for projects» can be used for any online or offline Bachelor or Master studies. It consists of methodical procedure, processes, collaborative work, didactics and technology aspects. The team members can easily store information on the different walls of the room. The information could be links to websites, PDF documents on the server, mails, WhatsApp or Google drive documents etc. The links are represented visually with images or icons. The links to online tools, such as generators for Personas and Mood boards or a Business Model Canvas Tool, etc. are also stored on the walls. Several additional rooms exist in addition to the walls, where information is displayed, stored, retrieved and combined. Beside the meeting room we recommend a relaxing, an inspiration as well as an energy room. Those rooms could help to find better ideas by broadening the view. Figure 2: Various aspects of projects (such as research output, problem solving ideas, project management, prototypes etc.) are stored in a 3D space together with virtual meeting rooms. The 3D space will be accessed on a screen or with the help of Virtual Reality goggles. We expect better results in project works since the students are guided through the process with the Design Thinking method. Students will learn to organize research and project outputs in a reusable and highly efficient way. They also will learn to store information collaboratively in a way that all group members have easy access.